LOOK: A New Movie Is In The Works For Jennylyn Mercado! Looks like we will be seeing Jennylyn Mercado back on the big screen next year according to producer Atty. Joji Alonso. Atty. Joji confirmed this through a comment she left on Jennylyn's Instagram post of her supporting Quantum Films' Metro Manila Film Festival 2016 entry 'Ang Babae Sa Septic Tank 2'. It can be recalled that Atty. Joji was the one who gave Jennylyn a big break through the 2014 box office hit and award winning film English Only, Please which was followed a year after by another award winning and box office movie #WalangForver. No further details have been released yet about Jennylyn's upcoming project with Quantum Films which will mark her third movie for the film company but our guess is that it will be another romantic comedy. Now, who's excited? Such a beautiful sight to see especially this Christmas season. Kapuso couple Jennylyn Mercado and Dennis Trillo spending Christmas eve with each other's families. Take a look at the photos below. Merry Christmas to you and your families Dennis and Jennylyn! LOOK: Dennis Trillo and Jennylyn Mercado wear matching Ugly Holiday Sweaters for Christmas! Dennis Trillo shared on his Instagram account a photo of him and Jennylyn Mercado at the Ultimate Star's home wearing matching ugly Christmas sweaters. The caption was short but full of meaning. The couple indeed brought "kilig" to their fans on Christmas eve. Merry Christmas Dennis and Jennylyn! LOOK: Jennylyn Mercado receives Gold Record Award for Ultimate album! Jennylyn's winning streak continues as her first album entitled Ultimate under her new record label Ivory Music and Video gets Gold Record status. Truly, blessings keep pouring in for the Ultimate Star. She was surprised by Ivory Music and Video at her guesting on Sunday Pinasaya where she sang the Christmas track off the Ultimate album, a cover of the popular OPM Holiday song Nakaraang Pasko. Award-winning and box office hit movie #WalangForever starring Jennylyn Mercado and Jericho Rosales will be airing for the first time on free television this Sunday on Kapamilya Blockbusters at 3:30PM on ABS-CBN. #WalangForever is Jennylyn and Jericho's first movie together. The movie was awarded Best Picture at the 2015 Metro Manila Film Festival Awards Night and the lead stars also took home the top acting trophies of the night. Christmas is almost here and My Love From The Star lead actress Jennylyn Mercado shares to GMA News how she plans to celebrate first Christmas without her dearest Mommy Lyida. She says she wants how they celebrated Christmas before to be the same as if Mommy Lydia is still around. Jennylyn also talked about how her recent trip to Europe has helped her cope with the grief. In another news, Jennylyn is making a Telebabad comeback next year via My Love From Star alongside newcomer Gil Cuerva. The Ultimate Star expressed how grateful she is to be part of the beginning of Gil's showbiz career. Jennylyn also described her leading man as very willing to learn and kind-hearted. LOOK: Ella Cruz thinks her "Ate" Jennylyn is perfect for the role of Steffi! Ultimate Star Jennylyn Mercado posted on her Instagram a photo from her first day of taping for her new project on the Kapuso Network, the Philippine adaptation of My Love From The Star. Teen star Ella Cruz was one of the many who cheered Jennylyn on for her role as Steffi. Jennylyn and Ella's last project together was for the movie The PreNup where Ella played Jennylyn's sister. Check out her comment on Jennylyn's post below. It's Jennylyn Mercado's first day of taping for her upcoming series, the Pinoy version of My Love From The Star! The Ultimate Star gave everyone a sneak preview of her character, the famous, pasaway, fashionista Steffi Cheon in this short clip. Watch Jennylyn nail her Steffi impression in the video below. She's just so perfect for the role! LOOK: 'Just The 3 Of Us' starring John Lloyd Cruz and Jennylyn Mercado is now on DVD! Star Cinema's 2016 blockbuster kilig movie, Just The 3 Of Us starring Romantic Comedy Royalties John Lloyd Cruz and Jennylyn Mercado is now available on DVD! Fall in love again with CJ and Uno and watch their story unravel over and over again at the comfort of your homes. Buy your copy now at leading video stores nationwide! It's official! Ultimate Star Jennylyn Mercado and newbie actor Gil Cuerva will play the roles of Steffi and Mateo in the Philippine adaptation of the worldwide phenomenon Korean drama series My Love From The Star. Announced today, December 9 on GMA's news program 24 Oras. Say hello to your Pinay Steffi and Pinoy Matteo! Jennylyn Mercado is one proud mama as she shared on social media her son Alex Jazz' photo taken from his first Holy Communion. Jennylyn prays that Jazz may always feel the love and presence of our Father Almighty as he receives Him in Holy Communion. Jennylyn also thanked son's teacher for always guiding Jazz. 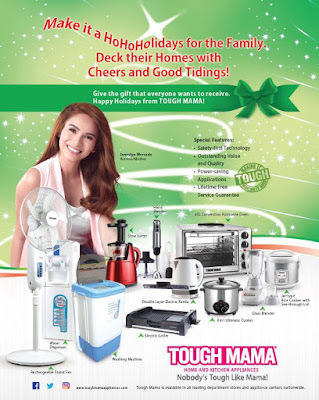 LOOK: Tough Mama offers perfect gift ideas this Christmas season! Looking for the perfect present to give your loved ones this Christmas season? Tough Mama Kitchen and Home Appliance offers an array of products that will surely bring joy to the hearts of everyone. Make it HohoHolidays for the family. Derck their homes with cheers and good tidings! Get them at leading appliance stores and department stores nationwide. A million Facebook followers is something but to have 9 times that is extraordinary! Congratulations Jennylyn Mercado for reaching 9 million likes on Facebook! You are truly loved by many. A very rare feat for any celebrity. Only a handful of celebrities have surpassed this mark. Make sure to LIKE her Official Page on Facebook! You can also follow her on Twitter (@mercadojen) and Instagram (@mercadojenny). Finally! The official music video of Hagdan, Jennylyn Mercado's carrier single from her new album Ultimate under Ivory Music and Video has been released. Ultimate is still available in music stores and record bars nationwide. The album is also available for streaming and digital download across digital stores worldwide. Please get a copy! Watch the FULL video of Hagdan below. Enjoy! The Ultimate Star Jennylyn Mercado finally received her star from Walk Of Fame Philippines, Thursday night held at Eastwood. She was recognized under the Movie category. Other inductees at the 11th Year of Walk Of Fame Philippines include Jodi Sta. Maria, Angelica Panganiban, Liza Soberano and many more. Take a look at some videos of Jennylyn from the event. Here's Jennylyn striking a pose for the cameras at the Walk Of Fame Philippines red carpet. And finally, Jennylyn receiving her star! Congratulations Jennylyn! We could not have been more prouder!